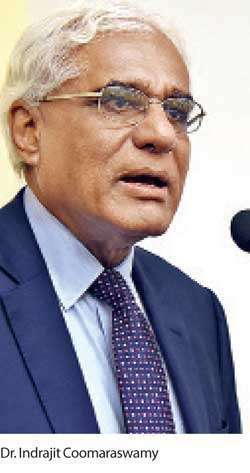 Sri Lanka needs to promote rural entrepreneurship in a holistic manner to uplift over one quarter of the population trapped in poverty with daily earnings below Rs.400, despite the lowest ever absolute poverty figures reported in the country recently, according to the Central Bank Governor Dr. Indrajit Coomaraswamy. “Entrepreneurship is critical to transform the livelihood of people in the rural sector who at the moment are trapped in low-productive and low-income livelihoods. I say that because absolute poverty in Sri Lanka is at a low level of 3.3 percent, which is based on a poverty line of US $1.30 per day. However, when you increase the poverty line to US $2.50, which is less than Rs.400, more than a quarter of the population in Sri Lanka falls below the poverty line with earnings just above US $1.30 per day,” Dr.Coomaraswamy recently told an event in Colombo, that felicitated young entrepreneurs, organized by a leading private sector corporate. He said rural entrepreneurship is key to get these masses beyond the income of US $2 per day while emphasising that the future of the economy is on the hands of the young entrepreneurs. He noted that 60 percent of the population live in rural areas and 27 percent of the country’s population is employed in the agricultural sector, which only contributes to 7 percent of the economy. Meanwhile Dr. Coomaraswamy pointed out that despite various parties having numerous programmes to promote small and medium enterprise (SMEs), most of these programmes have not been successful as they remain fragmented while marketing remains the biggest challenge for SMEs, which has not been properly addressed in these programmes. He noted that these programmes need to provide four types of support to SMEs, which includes; training with necessary skills, access to inputs and technology, access to finance and most importantly marketing in order to link up with rural, regional, national and international value chains. In addition, he said these programmes need to provide continuous support for entrepreneurs, at least for two to three years to get their businesses off the ground. Referring to Harvard research, he pointed out that Sri Lanka’s employment in the agriculture sector needs to decrease from the current 27 percent to 15 percent in order to reach the average of countries with economies on par with Sri Lanka. In order to employ the remaining 12 percent of rural population in non-farming activities, he asserted that young entrepreneurs in the rural sector need to take the lead in creating employment opportunities. Speaking of low productivity levels in the agriculture sector, he pointed out that 30-40 percent of agricultural products were getting wasted before reaching the market, which is mainly due to insufficient storage spaces, lack of refrigerating facilities and improper transport methods. He noted that the agriculture sector is in dire need of transformation to embracing modern farming practices, better seeds etc. He also said the archaic agricultural laws in the country needed reform. Dr.Coomaraswamy should be made the Economics minister. Only he understands the mechanics of uplifting poor masses in rural areas.The President should read his speech to get a better understanding of the current situation highlighlited by Dr Coomaraswamy.